Jarrah furniture is the quintessential Australian timber outdoor furniture and Lifestyle Jarrah make quality furniture which is built to last. With outdoor dining settings ranging in size from 2 seat balcony sets all the way up to 12 seat settings, in rectangular, square, round, hexagonal or octagonal, you'll be able to find exactly the shape you need here. Please click on an image below to see more examples of our work. We make a variety of outdoor dining chairs in addition to a selection of really comfortable outdoor lounge chairs and couches (2 & 3 seat sofas), benches, day beds, garden swings and sun loungers. We even make outdoor tables and chairs for children. We make each outdoor set to order so you can have exactly the size you need. All our indoor furniture is made to order with solid timber so is unique to your design and requirements, from dining tables and buffets, kitchen accessories, bedroom furniture and things for kids from the best Australian hardwoods - Jarrah, Marri, Tassie Oak and Australian wormy chestnut. We can also imported timbers such as American white oak and cedar. Give us your ideas and measurements or a simple sketch and we would be happy to quote. Can I order just a patio table or do I have to order outdoor chairs too? You are welcome to order just a table or just the chairs. Or you can order a combination of outdoor chairs and benches which is becoming very popular. Some customers have teamed our tables up with wicker chairs, some have made their own tables but run out of steam when it comes to making their garden chairs. 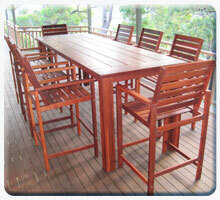 We have even made taller outdoor chairs and Jarrah bar stools to suit nonstandard tables! Can your make bigger outdoor chairs – Auntie Mo is larger than life and coming to stay? Yes we can make chairs for bigger people, or smaller people too for that matter. We have often made two bigger “carver” or more laid back Easy chairs which match the rest of the set, specifically for special family members. We understand that it is important for everyone to be comfortable – and we make kids timber outdoor tables , chairs and Jarrah picnic sets too! 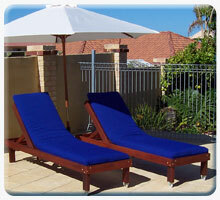 Is there a lighter coloured timber which can be made into outdoor or patio furniture? We have made patio furniture in Australian Wormy Chestnut and Tassie Oak which give a lighter colour pallet for outdoor furniture which will be in more protected outdoor spaces. We have also used American White Oak and Western Red Cedar to give a variety of colours for custom made outdoor furniture. My Granddad used linseed oil and turps to oil timber furniture outdoors – can I do the same? Your Granddad was doing the right thing but technology has progressed since your Granddads time – what he was doing was protecting the timber but as linseed oil dries very slowly it could be days before you can use your outdoor furniture again. The down side of the slow drying is it can leave sticky patches and it attracts dust and darkens the timber so you lose sight of the beautiful colour and grain in the timber. We suggest using Feast Watson Traditional Timber oil which has a UV protector included – we have been using this formulation for over 10 years. Can you make cushions for my bench? We make cushions to fit our furniture using a range of outdoor and alfresco fabrics which are Mould, Mildew and UV protected. All cushions come with zips and ties where necessary, and we can fit extra ties if you are in a very windy location. We don’t pipe the cushions but can send them out if you need them to have piped edges. Where does Australian Wormy Chestnut come from? Australian Wormy Chestnut, like Jarrah, is from the eucalyptus family- UCALYPTUS FASTIGATA– the timber we use comes from Gippsland in Victoria and is a blonde /pale brown with pink tones. AWC is native the south east of NSW and Victoria. Like Jarrah it has attractive grain as well as some gum vein and “wormy marks” within the grain [insert Picture here]. We have used this durable timber for furniture both for custom made indoor furniture and for protected outdoor furniture. I live right on the coast – will the screws rust? We use anodized screws and brass plated connector bolts as standard, as they are slightly stronger than stainless steel. However we use stainless steel chains, eyebolts and quick clips on our swings and you can request stainless screws on your furniture. As outdoor wooden furniture is traditionally treated with maintenance oiling this also helps to protect the hardware. Why do you use KILN DRIED timber when green timber is cheaper? We use Kiln Dried timber for all our handmade custom indoor furniture as well as for our outdoor or patio furniture as it minimizes any chance of shrinkage, twisting, splitting and warping – green timber has higher moisture content and will shrink when it dries out. We firmly believe Kiln dried timber is the obvious choice for outdoor wooden furniture, as Australian conditions are harsh with long dry periods of very low humidity and wood being a natural product will gain and lose moisture. Kiln dried Jarrah is also far less likely to stain your pavers which green timber or Kwila and some imported hardwoods may do. We feel it is a false economy to use cheaper green timber and we would not be confident that the furniture would stand the test of time. We probably spend as much on the purchasing timber as you may pay for a complete set made from green timber BUT you will probably spend hours tightening up the hardware, fixing splits and sanding back a set made with green timber. Our dog / puppy has chewed the legs of my outdoor chair, can you replace it? Yes we can replace the chewed part – if your chair was from our standard range we can supply another one from stock. If your chair was customized it is best to bring the chair or part in and we will make a replacement. We have even made Jarrah and Rope Dog Toys for persistent pets – the first one was made to a customer’s specs and solved her problem as the dog had its own Jarrah Toy to chew on and left the chairs alone. 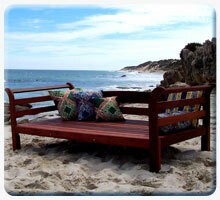 Can you send outdoor timber furniture to the eastern states? Yes we can send most outdoor furniture Australia wide – we flat pack in semi knockdown form for easy shipping and quick simple assembly. We have two methods of shipping, with a general freight company to a business address or transport depot close to you if you can arrange collection at your end or with Pack and Send to your door. If you provide your post code we can get quotes for you. How long does it take to have an outdoor timber setting made? Lead times vary but we aim to have your order made in 4-6 weeks. If you have a special date or deadline we will do our best to accommodate you. 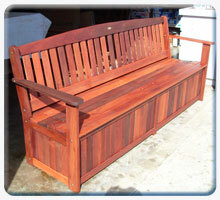 If you have an urgent need, say for a memorial bench, let us know and we will do our best to fit you in. Lead times do increase before Christmas so if you are after a new outdoor timber setting for Christmas please order early. 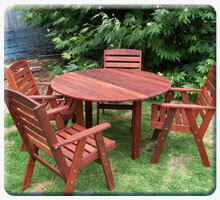 Can you deliver my outdoor Jarrah furniture assembled? If you live in the Perth Metro area we can deliver your furniture assembled – if you are in “down south” in the Bunbury, Busselton, Margaret River area we have a transporter, Q2 Transport, who can deliver ready assembled. If you live in WA you may also have a local company who can collect from our workshop. 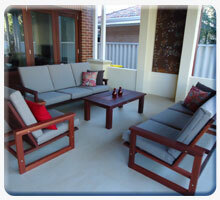 Do you have an outlet in NSW, Vic, SA, and QLD for your outdoor and patio furniture? Unfortunately we don’t have any outlets in the Eastern States but we do ship a lot of Jarrah furniture to the Eastern States. Some of our customers in the Eastern states have had a friend or family member in Perth stop by our workshop to see us. Do you need a deposit to start work on my swing set? 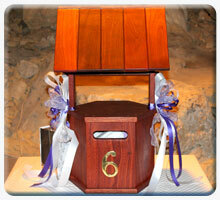 We do ask for a deposit as we have been left with custom made orders which don’t suit everyone. We usually ask for approximately 50% deposit and the balance on completion. We have mobile EFTPOS facilities for payment on delivery for Perth orders but ask for payment in full before shipping outside Perth. We accept EFTPOS, Visa, MasterCard or direct deposit to our account. I have been offered imported Jarrah /” Pacific Jarrah” /” Jarrah” coloured hardwood outdoor furniture, is it as strong as Western Australian Jarrah? Our understanding is that real Jarrah, Eucalyptus Marginata, only grows in the South West of Western Australia. 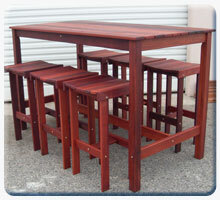 Jarrah coloured outdoor furniture may be made from the cheapest hardwood available which has been stained to look like Jarrah and will not have Jarrah’s unique strength and durability. We have never seen “Pacific Jarrah” but understand that this is a marketing name to given to a South American timber to give the impression that the timber being offered is Jarrah with all its great properties. We would like a memorial bench made – can you have it engraved for us? Yes we get an engraved plaque made for you and fixed to the furniture or have the timber engraved either by a laser engraver or routered engraving. Can we have our outdoor furniture varnished? Yes you could and some manufacturers do vanish outdoor furniture – our experience is that in the long term it is not such a great idea as varnishes will yellow and craze outdoors, necessitating having to sand back the whole piece before reapplying at least three coats of varnish, and to get a good finish you would need to fine sand again between each coat. A good varnish may last for about 5 years.